Jeepster wrote: Make any sense? Wouldn't it be fun to watch the 180GO! ... no ... the 90GO! team performing with Half Pint kites? That would be a fast routine. That would be awesome. We could do a routine to Benny Hill music. But Mike's kite would not be red, but rather pink to represent the girl Benny was always chasing. What a neat thrill ... the Half Pint was able to fly with his big brothers. It was done with Ben's blessing. Both Ben and iQuad jumped at the chance to tell Mike he was missed at Grand Haven. And of course, the humor in it had all of them laughing and jumping at the photo opportunity. John flew the non-vented kite in 10 mph winds and made it look so easy ... geez. Steve flew the vented Half Pint in 25 mph winds and made it look so easy ... he flew it smoothly from the very first second ... that is if 90 mph moves can be called smooth. 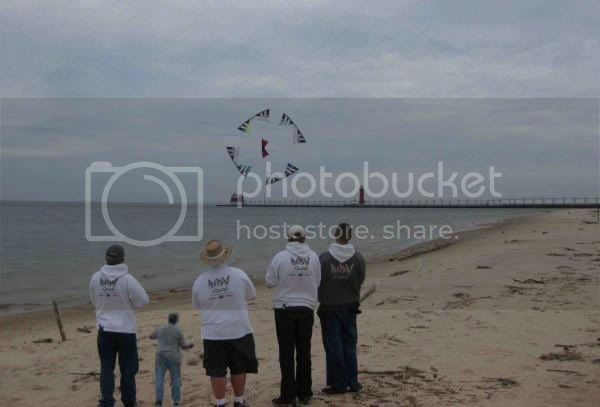 John grabbed Jamie's kite while Steve was flying the vented and they soon were threading the lines with the Half Pint and doing a routine. All this in 25 mph winds. Spent lots of time with Lee Sedgwick and Sam Ritter picking their brains about building and flying stacks. They are extremely talented stack flyers and very open to helping folks. Lee was very excited that I was using using the 3M tape and not sewing. Most of the weekend he was flying a modified UFO on quad lines that was built with tape. Would have never guess that Tom, I originally thought YOU ALSO were half pint in size!!! Too bad John wasnt flying one handed, and holding his other hand out from his side. It would have looked like he was holding you up. It definitely would have been even a wilder shot. Tom ~ Totally cool half-pint! The photo is precious!!!!! You should be Very proud! Ken - Is this the shot you were looking for? Last edited by DB Cooper on Wed, May 20 2009, 10:34 PM, edited 1 time in total. Thats even a BETTER shot then the one I had mentioned!!! Completed the third Half Pint earlier this week. Mentioned it to Mike and he egged me on to hurry and stack them. Since I didn't have enough bridle material to do the stacking, I used some 50# braided Dacron and only used four lines between the kites. The kites are placed about 85% of the leading edge length apart. The Dacron provides a little give ... not a good thing. Don't know if the spacing is appropriate, but the stack flies, so it can't be that far off. Will probably need at least six lines for the final stack ... if for no other reason than to keep the last kite from misbehaving. The three kites actually develop a good pull. It is a blast to fly. Still very quick, but not as skittish. If you're real, real careful, it'll back up. The line between everything being okay and everything being screwed up is very thin when backing straight up. The stack does almost every move that a single kite will do, but reacts the best when it's moving. Once in awhile I'd do something that would cause the last kite to loose lift ... 50 % of the time it'd correct itself and the rest of the time the walk of shame was employed. The winds were in the 5 to 10 mph range today. It was flyable with the winds down to 5 mph, but was easier at 10 mph. Looks like Sunday at Pontiac will be a good day to fly it. As far as length for stack lines is... about two thirds of leading edge. I have a three stack of exp's, I only have four stack lines holding the set together. They are attached at the points of the uprights. Adding more stack lines between kites will not help the last kite from misbehaving, the only true way of keeping the last kite on its toes will to never really stop the flying. Slowing down to a crawl or stopping will let the last kite fall out of place. Hope this shines a little light on idea of flying stacks Tom. Should be fun to see them flying this weekend. I think that is right, although I am far from an expert. I think the bottom lines on all but the front line have to be marginally smaller than the top ones (or is it the other way round?) to stop that wobbling effect. Jonesey (revforum) does quite a bit of stack flying so would be a good person to contact on this subject. Watch the last kite on the stack. If it tends to overfly the rest of the stack, you can make the brake lines a little shorter. Just tie a knot on the bottom lines between the penultimate and last kite. Another way to check the lines is to have someone stand underneath the stack while it's flying and watch the tension on the stacking lines. It's an interesting exercise to look at other folk's stacks this way. With stacks connected with 7 lines between each kite, I've usually seen the center line slack the entire time--in other words, doing nothing. To see the stack fly steady, hand the handles over to Sam Ritter or Lee Sedgwick. Sam once flew my 6-stack of 1.5s with one hand and held it perfectly steady. That stack had 7 lines. All lines were the same length on that stack except the center lines which were a little shorter because of the way they attach to the leading edge. On my Rev II sized stack of 5 kites, I use only 4 stacking lines between each kite. All the same length. Just for the kicker, on the progressive stack from Rev, all the lines are the same length even though the distance from one kite to the next varies because of the difference in size. E.g. the top of the verticals are the same distance apart, but the ends of the LE are farther apart. So the usual answer: perhaps antithetical to an engineer, is to stop messing with the stack lines until you've put in a dozen flying hours on the kite first. I was supposed to be assembling six half-pints for a linear stack. All the poly is in the basement ... black center with a three color hot fade. But, at the last club fly, I noticed, again, how neat Mike's progressive stack looks and flies. I've flown his and Big Bri's and they both flew great. Plus, it's kind of nice to be able to see all three kites ... with a linear stack the back kites kind of get hidden. So, back to the drawing board I went. Made a spread sheet that would allow the half-pint to be sized up. Experimented a little and came up with the half-pint (four foot LE rod) as the first kite, a five foot kite as the second kite and a six foot kite as the third kite. The third kite is actually a couple of inches smaller than a REV II. That progression in kite size is similar to the REV progressive stack trend. This time I installed screening in the leading edge of all three kites. Jim Foster is right, that adds a lot of work to kite building. The linear stack will probably revert back to burning holes in the leading edge for venting. I didn't use any 3M tape in the screening-to-sail joint. Simply used a wall paper seam roller to flatten the fold ... plus lots of blue tape. That process worked reasonably well. No prototypes this time ... just started with the small kite and built away. The third kite looks like the process is producing good results. Just finished the stack lines, so haven't flown it yet. No experimenting on stack line lengths this time. I had 60 feet of bridle line ... needed 12 lines ... thus, the line was cut into five foot lengths and knotted into stack lines. Last edited by Jeepster on Thu, Jul 16 2009, 08:17 PM, edited 1 time in total. Looks good Tom cant wait to hear about how well it flies and then to see it in flight.